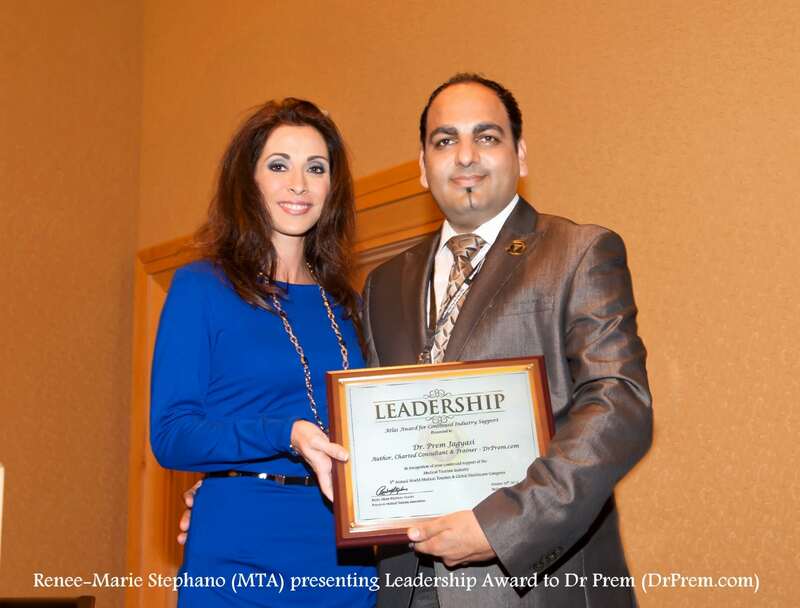 Dr Prem honored with Prestigious Leadership Award for his contribution in Global Healthcare & Medical Tourism Industry. Dr Prem, a successful Chartered Consultant, Global Trainer and Renowned Author, indeed was the unanimous choice for prestigious Leadership Award, as for several years he has been working effortlessly towards the advancement of Global Healthcare & Medical Tourism across the globe and has launched several global initiatives through his website www.DrPrem.com. The award was presented to him at recently concluded 5th World Medical Tourism & Global Healthcare Congress from Medical Tourism Association™ (MTA). 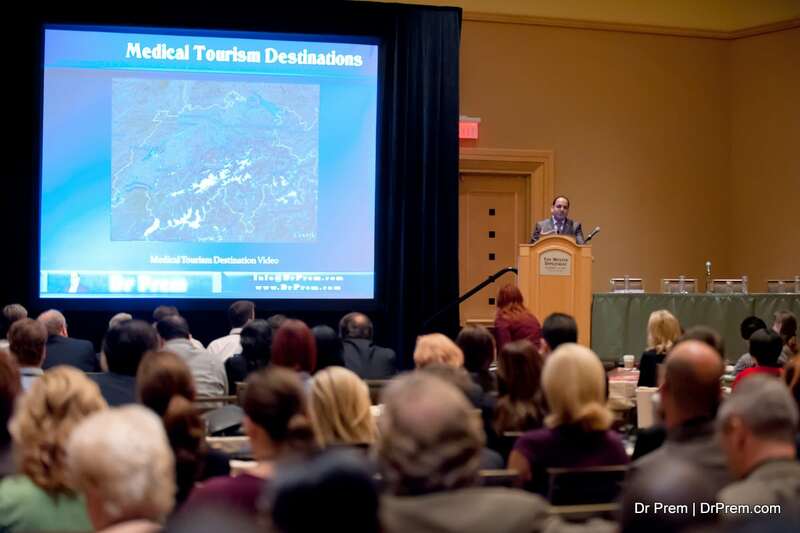 The event took place in South Florida, US, in conjunction with world’s prestigious Employer Healthcare, Corporate Wellness and National Reform congresses. Dr Prem is extremely overwhelmed with the honor received. He was presented the award amidst world leaders and government representatives from over 60 countries and above 2000 international delegates. Expressing his joy & pride after receiving the award, Dr Prem said, “I am honored to receive such grand award. I humbly believe that the award is not destination that I have to get relaxed, but it is an inspiring milestone, which will encourage me to continue to work towards better global healthcare and medical tourism industry”. According to MTA, these awards are strategic initiatives, which will work as a stimulator to eventually bring positive results for the medical tourism industry, intended to encourage and promote quality as well as best practices by industry players, whilst keeping consumer benefits in mind. Dr Prem has visited more than 40 countries to share his vast experience, and worked with more than 150 organizations across the globe helping them to improve and upgrade their medical systems. He has undertaken various initiatives to foster the growth of global healthcare & medical tourism industry worldwide. He offers multi-dimensional healthcare solutions ranging from healthcare management, Healthcare City Project Development to global healthcare expansion. He is also the founder of Global Healthcare– Worlds biggest community of Global Healthcare Professionals. Editor of two Health Magazines – Health First Magazine and DIYHealth.com, undoubtedly, he is a leading medical tourism consultant in the world and also the author of Medical Tourism Guide Book – an initiative to provide a comprehensive source of information for anyone considering medical travel. Moreover, Dr Prem is also the promoter of Insta Media Network, which has around 25 niche community websites loaded with rich information with millions of visitors a month. Dr Prem’s websites are trendsetters in many industries including Health, Luxury, Green initiatives, Beauty, Lifestyle, Travel, Wellness, Design, Home, Fashion, Technology, Entertainment, amongst many others. Dr Prem also possesses excellent skills in Online Management including Online Reputation Management, Brand Management and Online Presence Management. Apart from running a successful consultancy and global training business, Dr Prem has launched several global innovative initiatives projects such as Family Health Festival, No Tobacco Campaign, Summer Health Festival, Ahlan Ramadan, Diabetes Events etc in Gulf. His initiatives are endorsed and recognized by the country’s Ministry of Health and other government authorities. Currently, on global front, Dr Prem is working with governments, leading investors and global organizations on various projects. Dr Prem is willing to work jointly on several fronts including – Medical Tourism Projects, Healthcare City Projects, Merger & Acquisitions of Business & Services, Online Management projects and Strategic investment projects. He is also available for Global Trainings in the field of Leadership, Corporate Management, Global Healthcare, Medical Tourism, Corporate Wellness, Corporate Social responsibility, Online Management and many other training programs.